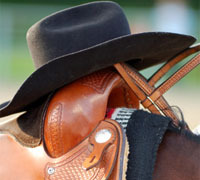 The National Reining Horse Association (NRHA) proudly presents the 2009 NRHA Derby Show at Oklahoma State Fair Park June 22-27. The Derby is one of two major events presented by NRHA each year in Oklahoma City. It is the Association’s premiere event for the world’s best four-, five- and six-year-old reining horses, their exhibitors and their owners. In 2008, the NRHA Derby Show welcomed more than 1,200 exhibitors and awarded nearly $630,000 in cash and prizes. The NRHA Derby Show is a great experience for horse lovers from all backgrounds and interest level. The first four days of the competition are free to the public making it an excellent option for the whole family. The event also offers many activities outside of the show ring such as a trade show with more than 50 vendors from around the country, MD Barns Round Pen Giveaway, Cimarron Trailer Bath, RHSF Taste of Reining, NRHA Collegiate Reining Championship, Rein In Cancer horse giveaway, OU Cancer Center free screenings and much more. FREE Admission – Monday, June 22 through Thursday, June 25 – Bring the whole family for plenty of reining excitement with free admission Monday, June 22 through Thursday, June 25. The competitions start at 8 a.m. each morning in the Oklahoma State Fair Coliseum and 9 a.m. in the Adequan® Arena. The show continues into the early evening each day. Both sections of the $30,000 added Non Pro Derby and the $80,000 Open Derby take center stage during the first four days of the event. Friday and Saturday’s finals qualifiers will be determined from scores posted Monday through Wednesday. NRHA Trade Show – Spectators at the NRHA Derby will be treated to a shopping extravaganza. The shopper’s paradise includes and array of vendors featuring jewelry, clothing, bronze sculptures, western rugs, tack, cowboy hats and boots – just to name a few. More than 50 vendors will be open weekdays from 9 a.m. until 6 p.m. and 9 a.m. until 8 p.m. Saturday. Most vendors will stay open late until the competition ends on Friday and Saturday night. Egg and Spoon Race benefitting Special Olympics – The National Reining Horse Youth Association (NRHyA) and its team of elected officers will give hand to the equestrian athletes of Special Olympics on Tuesday, June 23 starting at 7 p.m. in Arena 3 during the Platinum Performance Exhibitor Party. The officer team will host an Egg and Spoon Race featuring NRHA Open, Non Pro and Youth competitors. They’ll all go head-to-head to keep their team’s egg on the spoon while performing Reining’s distinctive maneuvers aboard their favorite mounts. Taste of Reining – Plan to attend the fifth annual Reining Horse Sports Foundation (RHSF) “Taste of Reining” on Friday, June 26 at 5 p.m. in the Cantina. The “Taste of Reining” features scrumptious cuisine from Cattlemen’s, Shorty Small’s, Texas Roadhouse, On The Border, Ovations Food Services, and more. Tickets are $10 at the door and include admission to a cocktail reception honoring past American Quarter Horse Association Executive Vice President Bill Brewer. Proceeds from Friday night’s event benefit the RHSF. Rein in Cancer – More than 1.4 million Americans are diagnosed with cancer each year. Rein in Cancer focuses attention on raising both dollars and awareness to fight the disease. Thanks to Rein In Cancer and NRHA, the OU Cancer Center will provide free cancer screenings and staff to answers questions. The screenings will take place on Saturday, June 27 from 10 a.m. to 3 p.m. outside of the NRHA Derby Show Office. In addition, Rein in Cancer and NRHA are hosting a horse giveaway to raise funds for the battle against cancer. Raffle tickets for Shortys Dream, donated by Bill Masterson, are being offered for sale online from nrha.com and at the show in the NRHA Outfitters and Shorty’s Caboy Hattery booths. Shortys Dream is a two-year-old American Quarter Horse filly with 90 days training. The filly and a 100 X hat from Shorty’s Caboy Hattery will be drawn for on Friday, June 26 in two separate drawings. All proceeds from the giveaway benefit Rein In Cancer. For those who want to show their spirit, Friday is “Think Pink” Day and everyone attending is encouraged to wear pink to help spread awareness of the disease. Get more information at nrha.com. Collegiate Reining Championship – Are you a college sports fan? Do you love to cheer for your favorite team and sport their colors? If you said yes, then you should come watch some of the finest collegiate riders test their Reining ability. 12 students from across the nation have qualified for the Collegiate Reining Championship competition through their collegiate and NRHA accomplishments. Come cheer them on Saturday, June 27 in the Oklahoma State Fair Coliseum. The competition follows the Youth 10 & Under Short Stirrup class that starts at 9 a.m.
MD Barns Giveaway – MD Barns is a leading provider in the horse industry of corral systems, round pens and interior components for existing structures. At this year’s NRHA Derby Show, they will award one lucky winner with a top-of-the-line MD Barns Round Pen. Be sure to stop by the MD Barns booth in the Super Barn to sign up to win a MD Barns Round Pen and learn more about their line of products.